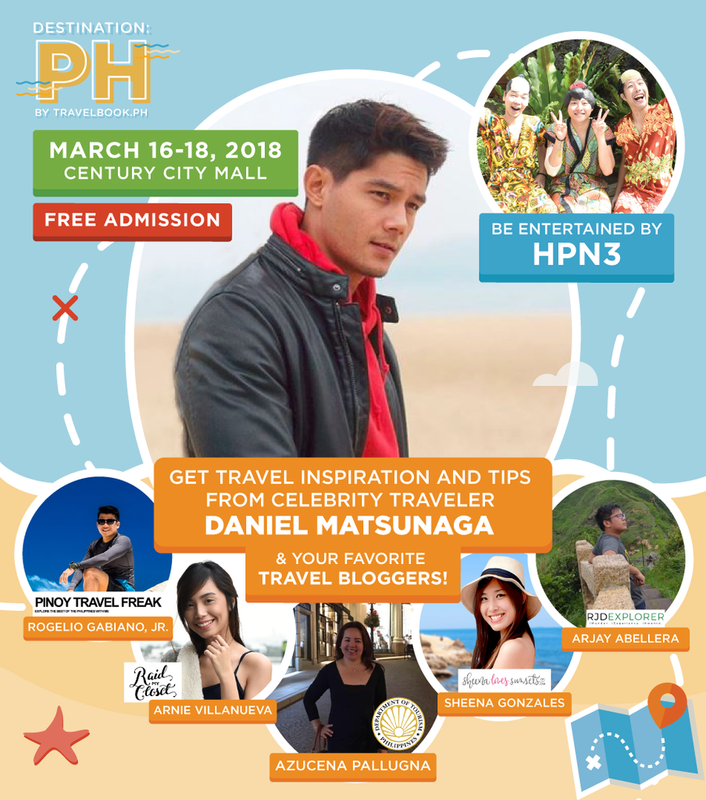 Score up to 40% off on hotels and tours, win amazing prizes, and catch your favorite travel bloggers on Destination: PH, a 3-day Travel Fair by Travelbook.ph happening on March 16 until Sunday, March 18 at the activity center, Century City Mall, Makati City. Missed the PTAA Travel Tour Expo 2018 last month? Here's your chance! Score amazing travel deals and achieve your #travelgoals this year through Destination: PH Travel Fair! 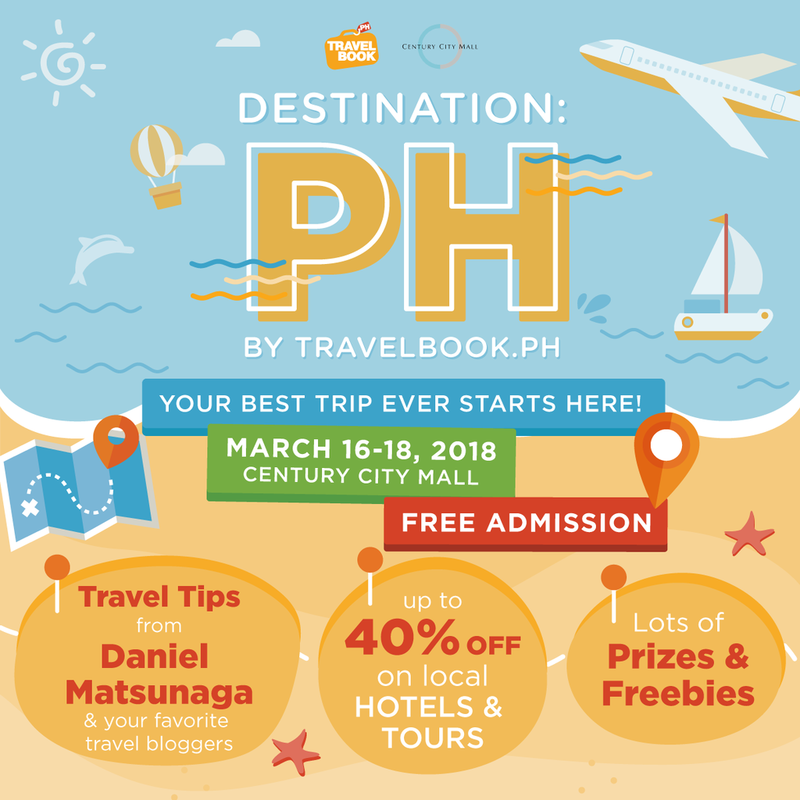 Destination: PH is the first travel fair launched by TravelBook.ph, the country's leading online travel agency, that is happening from March 16 to 18, 2018 at the 4th Floor, Activity Center, Century City Mall in Makati. "Each event attendee will receive one (1) FREE admission ticket with numerous stubs that will entitle them to discounts on the following hotels when they book through TravelBook.ph: 40% off in Circle Inn Iloilo, Circle Inn Bacolod, Azalea Resorts and Residences Baguio, and Azalea Resorts and Residences Boracay; 30% off in The District Boracay; and PHP 1,000.00 off in all hotel partners for a minimum booking amount of PHP 4,000. In addition to these fabulous discounts at the event, over 100 hotels and tour activities from TravelBook.ph will also be on sale. Tourism industry professionals will also grace the event and conducting talks: Senior Tourism Operations Officer Ms. Azucena Pallugna from the Department of Tourism's (DOT) Office of the Undersecretary for Tourism Development; travel blogger Mr. Arjay Abellara of RJ D Explorer blog; illustrator, designer, travel blogger, and contributing writer for ABS-CBN and Travel Now magazine Ms. Sheena Gonzales; lifestyle and travel blogger Ms. Arnie Villanueva of ArnieVillanueva blog; and travel blogger Mr. Rogelio Gabiano, Jr. of the Pinoy Travel Freak blog. TravelBook.ph made it even more exciting as attendees will get a chance to win prizes from the following sponsors: Azalea Hotels and Residences Boracay, Midori Hotel and Casino, Subic Bay Yacht Club, Siglo Suites by Century Properties, The Dessert Museum, Enchanted Kingdom, Zoomanity Group, Inflatable Island, World Traveller Bags and Luggage, AirAsia BIG, GetGo, and Mabuhay Miles." Interested attendees can pre-register for the event through TravelBook.ph's event page for Destination: PH on Facebook. Click the pre-registration link under the details section. What do you think about this event? Do you want to participate in this travel fair? Let us know your thoughts down the comment section below! Cheers everyone!